January is one heck of a month – this month has journeys set up for every weekend. The first two weekends were to my hometown, while the third weekend was set for Trivandrum. I had some work at Trivandrum (related to my visit there in November 2012). I blocked a seat for me on my favourite operator (Kallada G4). But at the last moment, the office at Trivandrum responded that my reason for visit was still not ready, and it would take more time. I initially planned to remain at home this weekend and take some rest. But one call home, made me change my program – I checked on the websites of most operators I know, and even on redbus. Only the expensive options were available – I did not want to spend that kind of money (Rs. 1500 and upward) for the 400-odd km run. 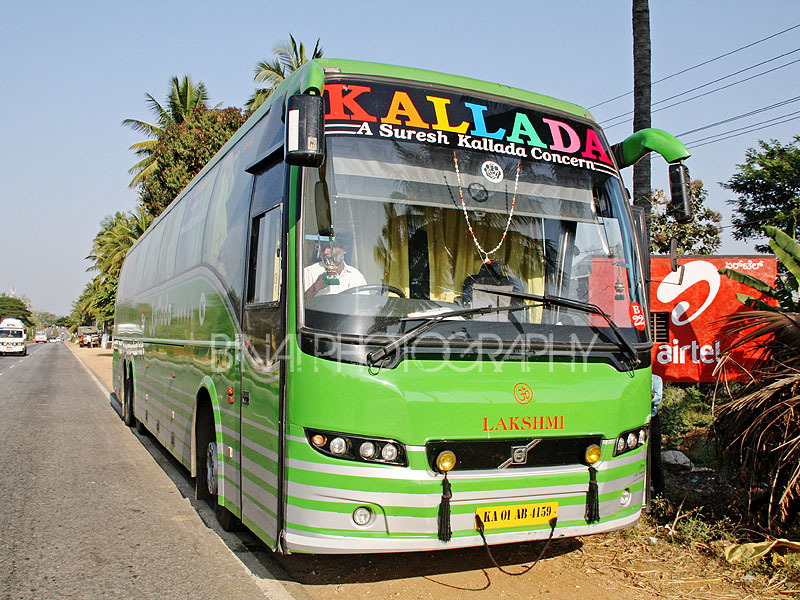 I wanted to try the Kallada bus via Mysore since a long time. 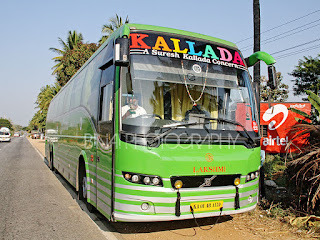 There are two Kallada (Suresh Kallada Tours and Travels) buses via Mysore from Bangalore – one leaves in the afternoon and that goes upto Trivandrum, while the other leaves at night and goes to Ernakulam via my hometown. The latter did not have any tickets, so decided to take the former. I booked my seat online, and selected seat #I1. Around 1410hrs, a person from the office comes with the reservation chart and verifies tickets. He takes my ticket, tears in into half, and gives me a portion. Kallada tickets booked online (both from their networked offices and through their e-reservation system) come in two parts – one part is their office copy and the other is the “Boarding pass”. After checking all seats, and ensuring that all booked passengers are on board, they signal the driver to start off. The bus finally starts at 1416hrs – late by a minute. The way the bus was handled at Kalasipalya was very efficient – unlike the Madiwala office where they wouldn’t begin checking till the departure time. The bus made its way out through Tippu Sultan Palace road, crawling through Chamrajpet. We directly exited on to Mysore road. Traffic was heavy as usual. Driving through Mysore road is no less than painful. It is painful all the way till RV College. After RV college, traffic reduced a bit. We stopped at Kengeri for a pickup (1441hrs), and then again outside Rajarajeswari Engineering College (1454hrs). After Bidadi, our driver stretched his legs a bit, and let the beast loose. The bus - KA-01-AB-4159. Taken when we stopped for a break. I did not check the speed on the GPS, because it was the typical speed up – brake for speed breaker – speed up kind of ride. They played a recent Telugu-dubbed-to-Malayalam movie – I somehow hate watching dubbed movies – mainly because the culture varies between the places, and the story does not really appeal to me. This movie was no different – I did not have another choice but to watch the movie, since it was all dry outside. We stopped at Ramanagaram for a pickup (1523hrs). We passed through Maddur at 1553hrs. I was hoping that the driver would stop somewhere for a quick break. I wasn’t wrong – sometime later, the driver pulled the bus off the road, and parked on the road side. I thought it was a pick-up, but understood that it was a quick break! The time was 1603hrs. I got off the bus, but could not find anything around – later saw a tea shop neatly hidden away! I took a stroll around and capture a couple of images. The driver was real quick – he was back in the bus in less than 6 minutes. We started off from there at 1612hrs. The place was somewhere before Mandya. The sun was on my side – so had to keep the curtain closed for most of time. I dozed off briefly – the movie was too unbelievable. I woke up when the bus stopped at the outer ring road junction, just before Mysore. The bus went into Mysore city. We stopped near the KSRTC Suburban Bus station – at 1708hrs. I saw the Nilambur-Bangalore KeSRTC bus for the very first time – it was an old Deluxe bus, repainted. The new ACGL built Luxury bus of Kadamba too was there. A lot of passengers got in here – we had occupancy of 47/48 now. We started off from Mysore at 1715hrs – the scheduled departure time is 1700hrs. The movie got over now, and a second one started. My co-passenger switched on music on his phone (through a headset) – the volume was so high that I could hear the songs clearly. I had to alert this gentleman that I did not want to listen to his favourite songs. Thankfully, his phone’s batter drained out, and the music stopped. We picked up one more passenger at Nanjangud (1750hrs). The attendant came around to take a final headcount – a passenger asked him when the break would be. He replied, “The break is near Gundlupet. We may reach there in 10 or 30 minutes - it all depends on the traffic”. Sometime around 1800hrs, the bus stopped in the middle of the road – we were crossing another Kallada bus. That bus was the Kozhikode-Bangalore-Hyderabad service – the crew exchanged pleasantries, and we got moving. The driver was at a good speed all through. It looked like he was enjoying driving on the two-lane road. We pulled into Hotel Coffee Stoppe, near Gundlupet at around 1821hrs. The attendant came around and announced a dinner break – he informed all passengers that there will be no dinner breaks after this – since we are entering the forest section. He requested passengers to at least get a parcel. There were two Kerala SRTC buses for company – one Super Deluxe to Guruvayur and one Super Fast to Kozhikode. I had my dinner. After dinner, went to the driver and had some chit chat. Poor fellow has been driving continuously for almost 24 hours now – the second driver got sick on the way, and the new driver would join only when the bus reaches Thrissur. He is a regular on the route, and has been Kallada since a very long time. The guy was very particular about timings. He got back to the seat quickly. We moved out of the break at 1847hrs. The KeSRTC buses had already left by now. We took a right after Gundlupet town, and entered the road towards Kozhikode. The driver was quick – the road surface was too good as well. The bus slowed down after entering the forest limits. The driver switched on the cabin lights at every check post. There was one horrible traffic snarl at Muthanga (the Kerala border checkpost) – we finally crossed the border at 1954hrs. The bus stopped at Sulthan Bathery to drop a passenger (2009hrs). I slept off after Bathery. The roads were not in great shape – the bus was bouncing up and down all the time. I woke up just as the bus entered the ghat section – this was my first time in that route in a multi-axle bus – this is what I was waiting for. The famous "Thamarassery churam" beckons... The bus slowed down a bit, but not much. We managed almost all hair pin bends without any fuss. At hairpin bends 7/9, 5/9 and 4/9, the bus had to back and then turn again. The other turns were managed easily. The ghats induced vomiting in many passengers – vomit bags were kept in all seats. The attendant was ready with more as well. The driver made a momentary halt at Adivaram (presumably to drop a passenger) – at 2129hrs. We stopped again at Thamarassery, in the town, for a passenger drop at 2143hrs. I had a nice sleep after Thamarassery. I woke up just when all the lights in the bus came on, and there was a commotion in the bus – we had reached Kozhikode! We first stopped outside the new Mofussil bus station (2225hrs) and then outside the Kallada office near Kalyan Kendra (on MM Ali Road) – at 2228hrs. One Golden B9R (to Trivandrum) and another Kallada B9R (to Bangalore, via Mananthavady) were waiting there. A lot of passengers got off at Kozhikode. The crew got off, and went to the office. New set of passengers got in. The bus started off after the mandatory headcount – at 2251hrs (scheduled time 2245hrs). The bus took the mini-bypass. I was half asleep by the time we joining back on the highway, past Ramanattukara. I got a call from home around 2345hrs, asking my whereabouts. My sound was all chocked up, since I was fast asleep then. I was still groggy – looked around to find where I was, and realised that we were at Edarikode (near Kottakkal) then. I replied, “Kottakkal”, and asked my bro to start from home after 0000hrs. Just then, the attendant came around to check if anybody had to alight there. I slept again – was hoping to see the bus transversing the Valachery mini-ghats – but was fast asleep then. We passed Kunnamkulam around 0050hrs – i had momentarily woken up then. Fell asleep again. I woke up only when I got another call from my bro – we were past Amala hospital then. We crossed out pairing bus around 0105hrs – there was a light and sound show then. Both the drivers flashed the lights and honked – similar to the flag exchanges in trains, many bus drivers exchange pleasantries on the move when they spot their colleagues. Another brief nap – I woke up just as the bus crossed Westfort Hospital, and took a hard right turn at Ponkunnam junction – the memories of waiting there for the KTC bus was fresh. The attendant came calling for passengers alighting at Thrissur around the same time. I moved forward as the bus neared the railway station. I stood in the cabin as we neared my drop-off point, the main office of Kallada in Thrissur (near Sakthan Nagar bus station). The driver’s fatigue really showed now. The new driver had already gotten in. The other Bangalore-Trivandrum bus (via Coimbatore), which leaves from Bangalore at 1400hrs, was also standing there. I guess my bus was better off – we came through a predominantly two-lane section with some good ghats in between and still matched the running time of the bus which came via the majority four-laned route! End remarks: The bus, KA-01-AB-4159, had about 1.5 lakh kms on the odo. It was maintained brilliantly – one must remember that the bus goes through horrible roads, and still did not have rattles. The rear LCD panel was not in good shape – it behaved the typical Carbon way. It went dead very often. Most operators have complained of the poor quality of Carbon LCD panels. The interiors were clean – considering the fact that the bus has a layover of only 2 hours in Bangalore! The crew behaviour was good – the attendant answered queries very patiently, and was always available on passenger requests. The end-to-end running time was about 11h02m – too good for a bus coming via Mysore. My previous journey in the same route (by bus) was way back in June 2009 – I was revisiting the route after almost four years now. I enjoyed the ride – and hope to make it again. Except the odd arrival at Thrissur, everything else is perfect for me. I am not a fan of high speed runs, and hence enjoy my runs in Kallada. Will I take this service again: This service was too good. The crew were well behaved. Hope Kallada can keep the same form in all their services. Maybe I’ll try it again.